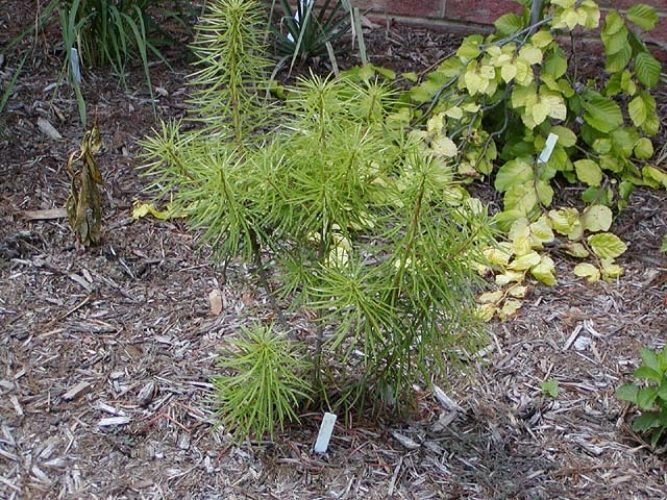 Cathaya argyrophylla, as described in 1962 by Woon Young Chun (1890–1971) and Ting-Yun Kuang in Acta Botanica Sinica, 10th edition, is commonly known as 银杉 (yin shan) in the Chinese language. 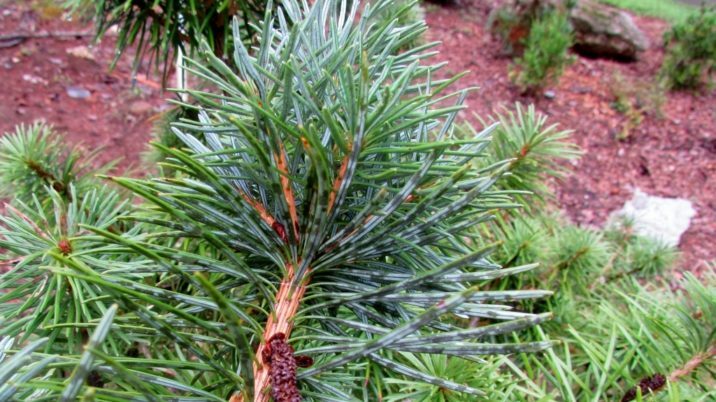 In the English language, Cathay silver fir is one of the most prevalent common names for this species, although Iseli Nursery, inc. of Boring, Oregon suggests a common name of "Chinese Mountain Tree." Time will tell which name will gain traction within the nursery trade. In the Greek language, argyrophylla translates into "silver leaf." Genetics work by Ge et al. (1998) and Wang and Ge (2006) indicates that, when compared to other conifers, Cathaya has rather low genetic diversity, but there are significant differences between populations that support the existence of at least four refugia where the species occurred during the last Pleistocene glaciation, suggesting that the populations have remained isolated since that time. Description. 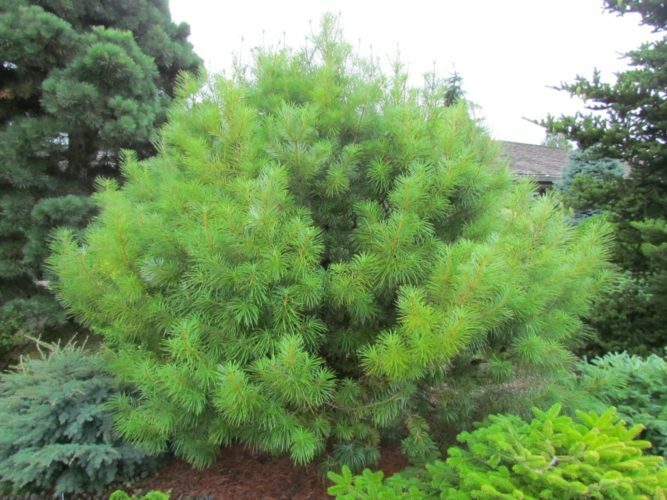 Cathay silver fir is an monoecieous evergreen coniferous species of tree that grows to mature heights of 65 feet (20 m) tall with a trunk up to 16 inches (40 cm) in diameter measured at breast height with a columnar, straight trunk. Bark on mature trees dark is gray, and irregularly flaking. 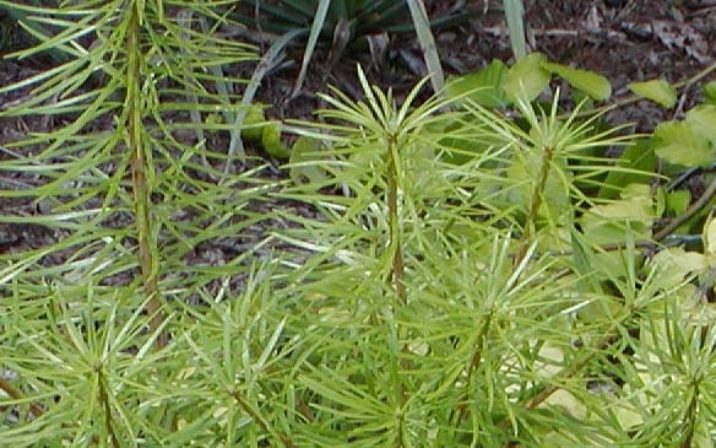 Shoots grow both long and short, similar to Larix; the long shoots with alternate rapid and slow growths that result in sets of leaves alternating with denser tufts; the lateral short shoots bear solitary leaves packed densely, appearing clustered. Leaves are dark green in color, measuring 1.6 to 2.4 inches (4 - 6 cm) long by ca. 0.1 inch (2.5 - 3 mm) wide on long branchlets, but nearly clustered into a whorl on short branchlets where they are not usually longer than 1.2 inches (3 cm). They are spirally arranged around the shoots, radially spreading, linear-oblanceolate with entire, slightly revolute margins and a rounded apex, slightly curved or straight, longitudinally grooved adaxially, with 2 white abaxial stomatal bands separated by an elevated midvein, having 1 vascular bundle 1 and 2 resin canals. The leaf surface is puberulent and densely pubescent along grooves. Pollen cones develop in sets of 1 to 3 from axillary buds on branchlets. 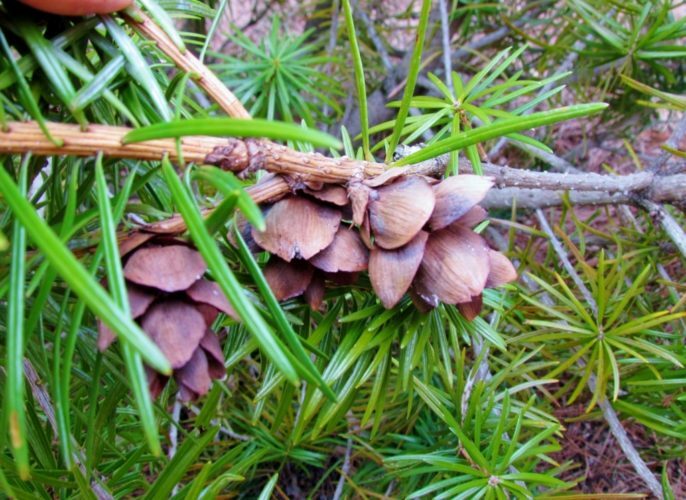 Seed cones are initially green in color, maturing to dark brown, with ovoid or ellipsoid shape. Individual seed cones measure 1.2 to 2 inches (3 - 5 cm) long by 0.6 to 1.2 inches (1.5 - 3 cm) broad. They are initially erect, later becoming pendulous, maturing in the first year, and often persist on the tree for many years. Seeds are dark green mottled with light green, slightly appressed, obliquely ovoid, and measure circa 0.2 by 0.14 inch (5-6 by 3-4 mm) with a membranous yellow-brown wing that is obliquely ovate or elliptic-ovate, that measures circa 0.5 by 0.2 inch (1-1.5 cm × 4-6 mm). Distribution. This species is native to China — southeastern Sichuan (Nanchuan Xian, Wulong Xian), northern Guizhou (Daozhen Xian, and Tongzi), southern Hunan, northeastern Guangxi (Jinxiu Yaozu Zizhixian, Longsheng Gezu Zizhixian) provinces growing at elevations of 3,000 to 6,000 feet (900 - 1,900 m) over sea level in mountains, usually on open slopes and ridges. Attribution from: Wu Zheng-yi and Peter H. Raven (editors); Flora of China, Volume 4; ©1999, Science Press Beijing, China. Cathaya argyrophylla — a handsome specimen at the Cox Arboretum, Canton, Georgia. Cathaya argyrophylla — a closeup of the undersides of the foliage. Cathaya argyrophylla — a closeup of foliage and cones.